New Delhi: Ministry of AYUSH Secretary Vaidya Rajesh Kotecha on Monday underlined the need to take forward the documentation of Morbidity Statistics across all healthcare setups in the country in a sustainable manner. He also stressed upon the mandatory requirements of AYUSH colleges and institutions funded by the Ministry of AYUSH under various schemes such as Centre of Excellence, Extra Mural Research, and Public Health Institutes which, he said, would certainly facilitate in the mass documentation of AYUSH morbidity statistics in an effective manner. Mr Kotecha was speaking at the two-day training programme on Documentation of Information into National AYUSH Morbidity and Standardised Terminologies Portal (NAMSTP) organised by the Central Council for Research in Ayurvedic Sciences (CCRAS), Ministry of AYUSH, which commenced here Monday. Speaking after inaugurating the training programme at which 74 nominated AYUSH professionals from across the country were present, he also recommended that master trainers, who are undergoing training, must take initiative to disseminate the capacity building in an effective manner across the stakeholders in different states. 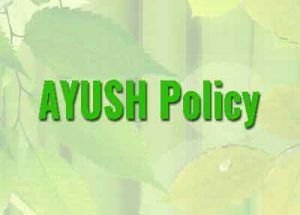 The Ministry of AYUSH has initiated efforts for centralised collection of data regarding the number of patients being treated by the various institutions of AYUSH systems located across the country. The centralised portal, developed for this purpose is recognised as National AYUSH Morbidity and Standardised Terminologies Portal (NAMSTP). On the occasion research publication of the Central Council was also launched. The AYUSH Ministry has initiated efforts for centralised collection of morbidity statistics pertaining to various systems of medicine under the Ministry, that is Ayurveda, Yoga & Naturopathy, Unani, Siddha and Homeopathy. The Ministry in association with Ayurveda, Siddha and Unani research councils has developed Morbidity Codes and Standard Terminologies of Ayurveda, Unani and Siddha systems of medicine. For Homeopathy and Yoga & Naturopathy systems the International Classification of Diseases (ICD- 10/11 Codes) of the World Health Organisation has been adopted for this purpose. The portal has the potential to revolutionise morbidity statistics data collection and may have a huge impact on the future policy making the decision by bringing to light the contributions of various AYUSH systems in the healthcare delivery system of the country. The key features of the portal include the Morbidity Codes and Standardised Terminologies of all the AYUSH systems for unambiguous reporting, electronic data submission through individual institution login IDs and also an integrated Electronic Health Records (E.H.R.) system for detailed data collection for individual institutions. The first training programme entitled “Training workshop to initiate centralised collection of AYUSH morbidity statistics through National AYUSH Morbidity and Standardised Terminologies Portal (NAMSTP)” for selected AYUSH professionals of research councils, national institutes and academic institutions was conducted on October 6, 2017. Four training sessions will be conducted in the two-day training programme covering topics such as Introduction to Medical Coding (ICD 10, 11), Introduction to International Standardized Medical Terminologies (SNOMED-CT, Chinese Medicine), Morbidity Coding Systems and applications in AYUSH domain, General introduction to Ayurveda-Siddha-Unani Standardised Terminologies and A-S-U National Morbidity Codes and also system wise hands-on training, an official release here said.